Jar City‘s decision to twice declare a pressing theme during the first act may be clunky and dispiriting, but such repetition is in keeping with the general mustiness of Baltasar Kormákur’s police procedural about weary Icelandic detective Erlendur’s (Ingvar E. Sigurdsson) inquiry into the murder of a truck driver. The story, based on Arnaldur Indridason’s 2000 novel, only feigns masking the culprit, in large part because its attention is focused less on whodunit suspense than the parallel personal plights of Erlendur and genetic database employee Örn (Atli Rafn Sigurdarson), the former trying to save his daughter Eva (Agusta Eva Erlendsdottir) from a life of druggy whoring and the latter grieving over the death of his five-year-old girl from a brain tumor. Unfortunately, reconfiguring the objectives of a standard murder mystery requires more than these stock character studies of wounded daddies, which exude sham profundity via a high-toned grim realism that paints Iceland as a chilly, isolated muckland of fetid marshes and austere apartment complexes. Like the story’s interest in the ethical quandaries raised by the collection of DNA material for research purposes, Kormákur’s fascination with Erlendur and Örn’s paternal protectiveness is more simulated than heartfelt, with the director’s beautifully ugly depiction of his environment conveying a sense of look-at-me pretension. 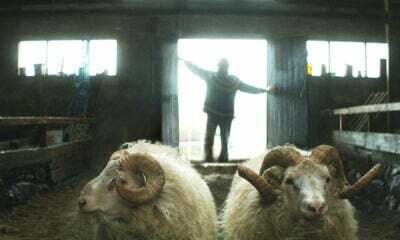 Consequently, the film’s intriguing suggestion that Iceland’s supposed moral and spiritual degeneration is driven by a form of self-cannibalization—expressed by the sight of Erlendur eating a sheep’s head for dinner and a pathologist chowing on meat while next to a corpse—takes a backseat to pompous Gregorian chanting on the soundtrack and shoehorned-in comedic sequences involving cops and criminals slandering Erlendur’s young partner as a “sissy.” A 30-year-old brain in a jar ultimately functions as a key plot point, but it’s also an apposite metaphor for Jar City itself, a film whose moral and sociological concerns are hemmed in both by obstructive aesthetic self-consciousness and genre clichés.